You can email photos of your fish tanks to friends and set up aquarium as an animated desktop screensaver. 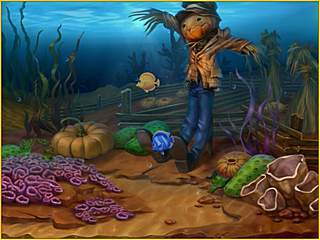 Prior to Fishdom: Seasons Under the Sea, Playrix had released holiday-themed Fishdom games separately: Fishdom: Spooky Splash (Halloween), Fishdom: Frosty Splash (Christmas), and Fishdom: Harvest Splash (Thanksgiving). So those of you who already own the three Splash games won't see any new content. 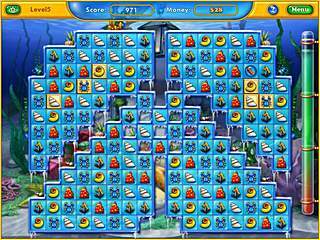 The game plays fast, smooth and pleasant, right the way the fans of Fishdom are used to. You are provided with timed and relaxed mode, so you can choose the pace that suits you the most. The graphics are clear and colorful. The imagination of the artists impresses: hardly the Mother Nature has created so many types of fish you may see in the game! The music is frisky and absolutely fitting. Unlike Heroes of Kalevala Fishdom: Seasons Under the Sea is a pure swap 3-match game, so there is no group- or chainmatching. So don’t get upset if your chain didn’t work out. It’s just not the proper case. You’d better enjoy taking care of quirky tropical fishies and adding amazing themed accessories to your virtual underwater kingdoms. All the Fishdoms are bestsellers, so the main question is that whether people will buy 3 in 1, or just go past the mixed edition. The game has by the way two wonderful extra options. You can email photos of your fish tanks to friends and set up aquarium as an animated desktop screensaver. Holidays are coming! Get yourself into the holiday mood: recreate the festive atmosphere of three great holidays in your tanks! Well, I surf the internet and comitnmcaue with people.I also design web sites.I also spend an inordinate amount of time working within Adobe Photoshop doing graphic design work.I also encode movies you know, ripping down from DVD to a small 700mb storage file, and then reconverting others back up to DVD format.I also use it to edit movies, and make music videos from scratch.I also use it to capture video.I also burn CDs and DVDs or various types, from DATA to music and video.I dabble a bit in programming C++ and Java.Do you really think that all you can do with a computer is play games? This is Fishdom: Seasons Under the Sea review. Download this game here.